By now, UK reality TV star Brandon Myers’ enormous bulge should have its own social media account… then again, that’s what Brandon Myers’ regular social media accounts are. And this time, in a video meant to show his workout progress and his abs, his bulge took center stage, as usual. His fans were understandably ecstatic. 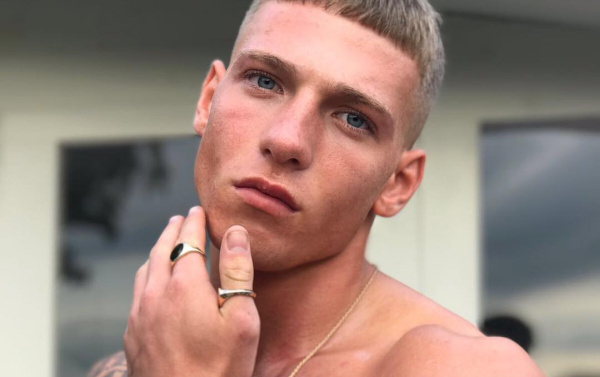 Brandon Myers, the 21-year-old star of TV shows such as MTV’s Ex By The Beach and Bromans, often posts raunchy photos of himself and his big bulge on Instagram, and sometimes of his bare bum. But it’s mostly about the bulge. Brandon’s latest video, which he posted on Twitter, is captioned “Current condition. Watch me in 6 weeks” – and he moves around, pulling his underwear down slightly, putting his abs on display. But yeah, sure, we’ll wait to see what happens in 6 weeks. And in 6 days. We’ll just keep watching.